Somerset based artist Jon England is known for his work around the legacies of WWI and WWII. His work uses the specificity of site, the minutiae of experience and the tangibility of objects to connect individual experience to globally significant events. He combines traditional painting and drawing techniques with an innovative use of found and historic materials to create resonant connections to these histories. Recently, he created the centerpiece installation ‘Seeds to the Wind – Duty? Honour? Freedom? Sacrifice?’ for the ‘Somerset Remembers’ WWI Centenary exhibition at the Museum of Somerset, Taunton. 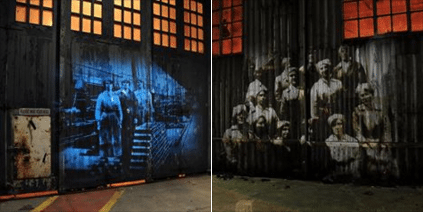 In 2013, his work Operation Chameleon at Fleet Air Arm Museum in Yeovilton, included etchings in painted aluminium, made in response to the Engineering Department’s pioneering restoration of a Grumman Martlet WWII aircraft. During his residency between January and April 2016 Jon will work within the area surrounding Eastville to explore architectural, archaeological and social legacies of global conflicts. An interplay will be created between the project space and the world outside, revealing the forgotten, enigmatic or unexpected histories, still inherent in our present day experience of the town and in the relationships between individuals. An event will take place in April to share his findings during the residency and to invite people to contribute their local knowledge around this area. Join the artist on the 9th April 2-4pm, to hear more about his previous projects and his research during the residency. Come and join us to share your memories and views about Yeovil.